Five years ago today, Governor Scott Walker began what I refer to as the Conservative Surge in Wisconsin. He introduced a budget repair bill that became known as Act10. It contained some of the provisions I laid out months before. Herein lies the problem with public employee unions: They determine the fate of their own bosses who in turn have dominion over their compensation. Public employee unions skew the labor-management equation through their political muscle and the fact that their contracts are approved by the very same politicians for whom they vote. Therefore, they have the power to perpetuate and accentuate their own wage and benefit structures at the expense of the taxpaying public. 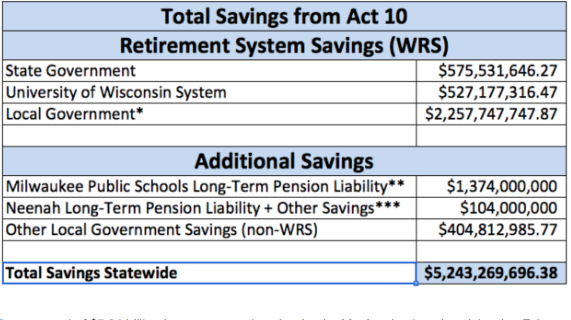 Building painters in school districts with annual compensation packages of more than $98,000 and bus drivers making six figure salaries that translate into benefit-rich pensions are part of the driving force in the budget problems facing Wisconsin. Unfunded and underfunded pension and retiree health care liabilities are ticking time bombs at every level of government. Wisconsin’s state budget doubles the trouble. As a matter of public policy Wisconsin lawmakers have chosen to fund a great deal of local governments’ and schools’ budgets as a means of controlling property taxes. Yet, as school boards and local government employers lack the tools and the will to control wages and benefits, these expenses skyrocket. Since enactment of the law in March of 2011, Wisconsin taxpayers have saved more than 5 billion dollars. My friends at the MacIver Institute have the details. I conveyed my thoughts on the matter in a series of tweets earlier. Today’s the anniversary of @govwalker proposing what became Act10. But that wasn’t an achievement. Having the courage to pass & sign it was.